International Chambers' of Commerces Football Tournament powered by Danske Bank is approaching again on Saturday, May 28th at Maarjamäe stadium. Information about the previous tournaments here. Maarjamäe stadium situates in Pirita district, next to the German war cemetary and the Maarjamäe memorial. The stadium was opened in summer 2007. It includes a large grass field, where fields in various sizes can be marked for both adult and junior trainings and competitions. The stadium setup includes also artificial grass field, tennis court and a building with changing and administrational rooms. 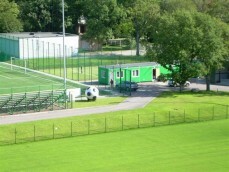 The stadium is currently used by the FC Levadia.